Stenciling tools, stencil brushes for DIY project. Foam roller for wall stencils. This Stencil Essentials Kit contains all 3 necessary tools for your DIY stenciling project. Save 10% off the price if purchased separately! Dense Foam Roller. 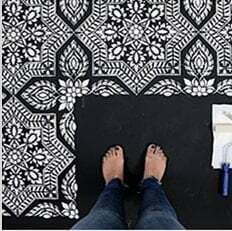 The easiest and fastest way to apply a stenciled image to a wall. Perfect for wall stencils, allover patterns such as damask and scroll, faux frescoes and mural stencils. Natural 5/8" White Bristle Stencil Brush. Good quality stencil brush with soft white natural bristle, perfect for finishing edges and corners, and for shading and smooth color blending. Our Innovative Clip-on Stencil Level. Clips to the edge of your stencil and eliminates the need for bulky bubble levels and string plum-bobs. Huge time-saver! Get perfectly leveled stencil pattern every time. Great for geometric stencil patterns, damask stencils, stencil borders, stripe stencils, French panels and any stencil ornament that needs to be level.